On Saturday John the Red came up for a long awaited game. Flanders in 1794 was to be the setting so I pulled together a scenario pitting the French (under the command of former hussar corporal and retired government inspector, 'General' Nicolas Cindre du Tonne) against a combined and rather dispersed alliance of English, Austrian and Emigre forces commanded by the famously liberal for his day and future United Irishman, Lt. General Sir John McCann, 1st Viscount Roseberry. With the exception of the Emigre brigade under the Prince de Rohan and the Allied (largely English) cavalry brigade the arrival of reinforcements was to be a bit of a lottery. Six numbered and scrunched up pieces of paper were put in a cup, with the numbers representing each of the six possible reinforcing brigades. From turn 2, two pieces of paper were selected at random. One was immediately discarded without looking at it and the other was kept and the appropriate brigade would deploy on the table, either through the woods, at the crossroads or along the road on the Allied left. That way neither side had any inkling about what was left 'in the pot'. I have to say it worked rather well. The objective of the game (apart from the destruction of the enemy) was the crossroads in the centre of the Allied position which were vital to a successful defence/attack on Brussels some miles to the north. The French started with their advance guard on the table, and would be reinforced every even numbered turn. For reference the blue wall with the paintings on is north. We used Black Powder with a few appropriate period tweaks. So, en avant! A bataille! The battlefield from the south east. The French have a demi-brigade legere in the centre facing the Emigre-held farm and adjoining fields, with their cavalry brigade deployed facing the Allied cavalry which is just out of shot. A Royalist sympathiser on the staff managed to get the accompanying horse artillery 'lost' on the march, (which is to say I forgot them) so only a single section was deployed, supporting the infantry in the centre. Turn 1 saw the French cavalry rush forward two moves as their short sighted commander General Maxime Hazard forgot to say how far he meant them to go. Several enemy sheep were driven off without loss. In the centre the chasseurs of the Damas Legion held the farm, and began a tenacious defence that would last the entire battle. The French light infantry moved towards the farm and immediately assaulted it from two directions. Both attacks were beaten off and one battalion was ignominiously broken. 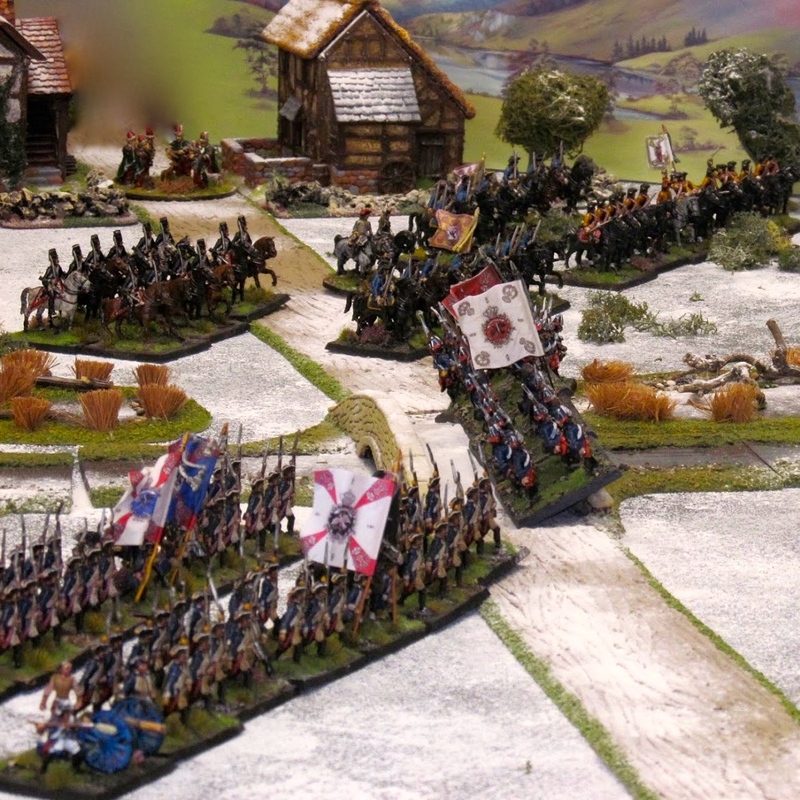 The 10th Light Dragoons screen the Allied cavalry. Behind them are the 1st Dragoon Guards, a composite Household Cavalry regiment, the 15th Light Dragoons and a regiment of Austrian Hussars. On the French left two regiments of Chasseurs a Cheval advance in an attempt to turn the Allied flank. The English cavalry charged the rather exposed French and drove off shaken a weak regiment of heavy cavalry, but not without some loss. John's random reinforcements were a brigade of Austrians made up of a battalion of Grenz, two battalions of infantry and two small companies of freikorps jager. This command was led by a truly dreadful commander (a '6') and appeared marching up the road behind the cavalry on his left. 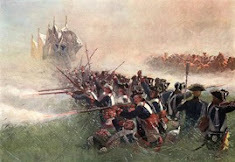 The Household Cavalry charged and defeated a second French regiment but wisely did not follow up. My Dragoons then charged the Austrian hussars (not seen here as they ran so quickly I couldn't take a picture of them!) and then crashed into the reforming Kings Dragoon Guards. The French were defeated and forced to retire. The Austrian column snakes along the road. 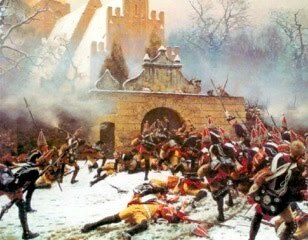 If only the French had won the melee. We might have been able to sweep forward and hit the Austrian column in the flank. Of course, it was not to be. Over the course of the following couple of turns the French cavalry brigade was broken and eventually fled the field en masse! I made a change to the broken brigade rule, whereby rather than surviving units being forced to retire, the entire brigade throws a break test each turn to determine their fate. Unshaken units could still act as normal. As it turned out the brigade stood for one turn then up came the dreaded snake eyes, and all five regiments buggered off! The French, taking the advice of the late Queen, brought up their mobile patisserie. My reinforcements were making slow progress, possibly distracted by the smells wafting from the ovens and the delights of the cantiniere. The light cavalry had advanced too quickly and were surprised by English reinforcements (the Brigade of Guards no less) who appeared on the edge of the wood and shot them up badly, forcing the cavalry to retire. HM 1st Regiment of Footguards (left) and HM 2nd Coldstream Guards supported by a section of 6pdrs on the edge of the wood. A very opportune arrival for the Allies. Turn 4 saw the arrival of another two demi-brigades of French on the eastern end of the battlefield. They were classed as newly raised and were pretty crap really, but John didn't know that. He threatened their flank with the Household Cavalry but one battalion occupied the farm and another managed to deploy into line. Their combined fire, help by some poor saving throws by John saw the cream of the British Army flee the field! I wasn't able to advance much further as an Austrian 12pdr cannon and their jager were quite effective at halting my advance. Oh, and an entire demi-brigade (the one on the right) blundered off the table and didn't return for two turns! On the French left the original reinforcements were at last shaking out into attack columns and their supporting artillery had deployed. 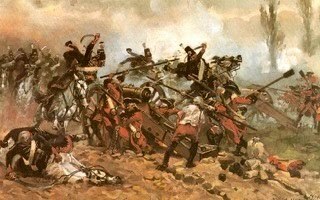 One of my chasseur regiments was forced to retreat due to the weight of fire coming from the English Guards. 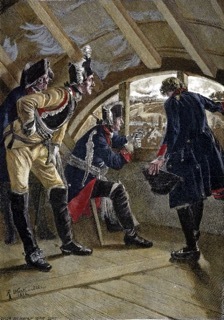 The French artillery began an ineffective bombardment of the English. The 1st Footguards were forced into square by my remaining chasseur regiment, and the brigade then began a withdrawal back to the woods. The Prince de Rohan was still holding the centre, and had successfully driven off the lone French cannon in the centre. The Rohan Hussars were looking threatening. All John had to do was get them moving. John did indeed get them moving, but only across the hedge. My legere were looking rather threatened. On the left the French advanced, successfully blocking the line of sight for their supporting artillery which limbered up and relocated on the edge of the fields. They forced the Damas Legion to pull back. The French left grinding to a halt. The Rohan Hussars charged and made short work of my light infantry who failed to form square and were wiped out. This meant that my centre brigade was broken, but what was left of it held on for a while. The Austrians marched the length of the table and began to deploy facing my attack. My final reinforcements arrived in the centre but I wasn't keen to throw them forward as they were mostly newly raised troops. The Grenz had occupied the church and the artillery was about to deploy on the left of their infantry. We had to call it a day by then as we'd been playing since 11 a.m. and it had just turned 4p.m. The game was paused only for lunch and for a spot of bird catching as one of the cats had brought one in from the garden. It escaped and flew into the games room before eventually being coaxed out of the house but it did disrupt my photo taking. After John left I played two more turns to see if another French attack would succeed. It didn't as the brigade in the centre was unable to break into the farm or drive off the Emigres in the fields and was then run down by Allied cavalry, the attack on the left ground to a halt and the troops on the right refused to move! So, a French defeat. Merde! Actually it was an excellent game that was a hard fought contest that could have gone the French way. But it didn't. Next time! Great to see someone gaming this colourful campaign Colin. Lovely stuff. Quite a game! Nice to see you could conclude it at a later time. Is there a code or something about living out in the sticks that says you need sheep on the table for every game? It's become a traaaaadition Paul. Enjoy your AARs immensely. Oh, I do trust that Royalist sympathizer on the French staff was given a barbershop appointment with Madam Guillotine for a close shave? I suspect he or she has escaped to live another day and wreak havoc with the French command! Once more a super game full of drama, action and colour! A great advert for our wonderful hobby! Another excellent game, well hosted by Colin. First time i have been dive bombed by a stray bird in midst move! It took 2 cats and 2 men, watched by 2 dogs to flush out the bird and eventually return it to safety !! All the clues were there, (French staff work astray, troops turning up where not expected, a crossroads) but i was too wrapped up in trying to fend off French assaults and diving birds to pick up on it til the end when Quatre Bras was mentioned! One of my commands (that remained off table) was even commanded by one A Wellsley. The Allied Horse did its job but perhaps with minimal glory and panache. 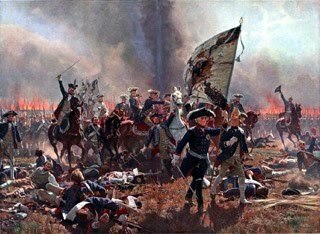 THe Austrian Hussars and 15th LD did not repeat history and rout a French army by themselves. The honours of the battle went to HH Rohan's Damas Legion, who held both the walled farm and the flanking fields through out the game against larger French forces. When it was time to go, we felt the French and indeed Madame Guillotene demanded, one more attack to see if the still considerable forces could push on to the roads but there chance had gone as it transpired. I'm just in the middle of assembling my Foundry guilloutine set this evening. She will soon be working overtime. Have you seen the British from victoriousminiatures.com? Roundhats and Highlanders plus some officers at the moment but apparently more coming. Looks like a great game Colin- the very early Napoleonic/Revolutionary War period is a bit of a change from the usual later games with some great looking uniforms on both sides! PS I love the Eureka field bakery - I have been sorely tempted to purchase this set myself! Fabulous game! Love the figures, table and terrain. Great Batrep!